“Accelerate’s work was super-duper," said trainer John Sadler. There were more significant workers at Santa Anita Saturday morning than there is spittin' in a Clint Eastwood Western. With the weather clear, the track fast, the sun shining through azure skies and the 35th Breeders' Cup less than a week away, Nov. 2 and 3 at Churchill Downs, horses expected to participate were out en masse in their final major drills for racing's championship event. Heading the cast was Breeders' Cup Classic favorite Accelerate, who went six furlongs under assistant trainer Juan Leyva for John Sadler in 1:12.80. 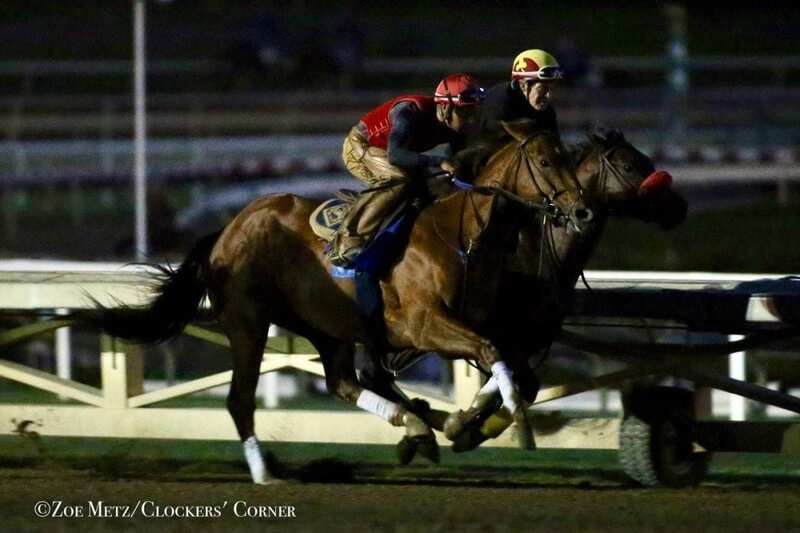 Accelerate covered five furlongs in 1:00.80 with a seven furlong gallop out of 1:26.20, according to Santa Anita clockers. Sadler also sent undefeated Dirt Mile favorite Catalina Cruiser five furlongs in 59.80 and Filly & Mare Sprint contender Selcourt the same distance in 1:00.40. The trio will leave for Kentucky Sunday, as will Sadler. Bob Baffert supervised workouts by Classic second choice West Coast, Classic contender McKinzie, and Filly & Mare Sprint favorite Marley's Freedom. West Coast breezed four furlongs in company with Trojan Magic. They were timed in 47.20 and 47.40, respectively. McKinzie went five furlongs in company with Dabster, receiving clockings of a minute flat and 59.60. McKinzie was ridden by Joe Talamo, who would ride Collected for Baffert in the Classic should the speedy colt draw into the field. Drayden Van Dyke worked West Coast. Baffert said Mike Smith would ride McKinzie in the Classic and John Velazquez would pilot West Coast. Marley's Freedom went four furlongs in a bullet 47 flat, as did workmate Super Sol. They were the fastest of 53 drills at the distance, the average time of which was 48.88. Hall of Fame trainer Jerry Hollendorfer worked Gunmetal Gray and Dueling for the Juvenile, going 48.60 and 49.40, respectively. “Both riders were happy,” Hollendorfer said, alluding to Flavien Prat on Gunmetal Gray and Freddie Rodriguez aboard Dueling. “We're all set to go.” The two-year-olds ship early Sunday morning, while Hollendorfer will leave on Monday. On the training track, rags-to-riches Skye Diamonds (Filly & Mare Sprint) worked five furlongs in 1:02.20 under regular rider Tiago Pereira. “She did just we wanted,” part owner Jon Lindo said. “She came home in 35 and change and galloped out really strong. She's taking us to the Breeders' Cup. It's not like we intended for her to take us there. “Now we just need good weather and a good post.” Lindo said there was a 60 percent chance of rain in Louisville next weekend. Prior to Friday's first race, Classic longshot Pavel worked seven furlongs in 1:26.45 for Doug O'Neill under regular rider Mario Gutierrez. Winner of the Grade I Stephen Foster Handicap at Churchill Downs last June 16, the gray son of Creative Cause received fractional times of 24.87, 49.87 and 1:14.37. This entry was posted in Breeders' Cup, NL Article and tagged accelerate, Bob Baffert, Breeders' Cup, breeders' cup classic, catalina cruiser, churchill downs, john sadler, john velazquez, mckinzie, mike smith, pavel, santa anita, west coast by Ed Golden/Santa Anita. Bookmark the permalink.